... and a rose is a rose is a rose! There's no doubt that Dylan and Dante are tried and true mancats. However one of them has demonstrated a truly genteel composure and the other has not. Can you guess which is which? Domino has graciously offered herself up for this experiment. How one treats a ladycat is a real test for any would-be gentlemancat. First up is Dylan. You may recall these pictures from earlier this month, but they are required once again for comparison PURRposes. Dylan has succumbed to his baser urges and assaulted a ladycat's PURRson. Consequently, he has ended up quite alone. By stark contrast witness Dante. ... while maintaining an appropriate distance. Consequently, Dante and Domino are quite at ease. They are a picture of true harmony as they continue to enjoy each other's company. Dante has a set a new 'benchmark' for gentlemancatly behaviour -- one that Dylan may certainly aspire to. With Dante as his role model, we are ever hopeful that one day, Dylan will gently reign himself in and join the ranks of honourable gentlemancats. Dylan -- your day will come! One more reason to love Dante! And he looks very scholarly in his striped sweater! Just as long as those boys know that Dommy is my gerl! Milo (a teeny bit jealous). I wish Dante would give lessons! Kirby needs to learn a lot. He is following Dylan's example way too much! Dante looks awesome in his sweater! Domino and Dylan are as beautiful as ever! Love these cats! Dante knows sisters are cool! You are both looking great! I can tell you something about OUR house - NONE of us are ladylike! oh you like to wear sweater? 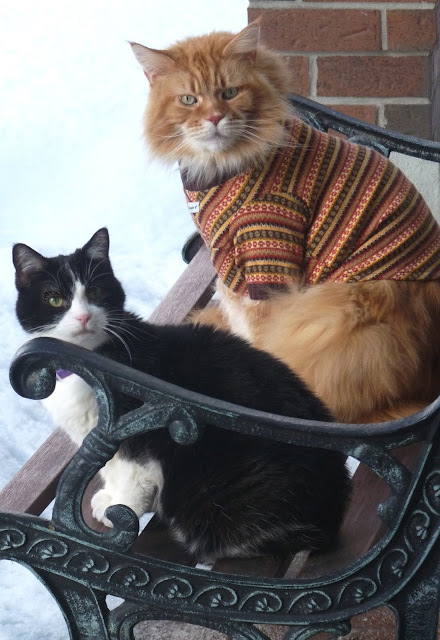 our mama cannot get us to wear anything but our collar. We knew Dante was the gentleman! We love seeing his sweater, but we think Domino probably needs it more than he does. Good thing you got her a pretty coat! TUXY TUESDAY WITH DOMINO: TOP CAT'S TOPCOAT! WORDLESS WEDNESDAY WITH DYLAN: DUMBFOUNDED! TUXY TUESDAY WITH DOMINO: WHO DINI?